Didn’t feel too good leaving for my 10×800 set today. Just finishing three hours of working in the garden before I left in the most likely culprit but the 5km swim yesterday could also be a contributor. I could probably go on and on about what was wrong and why but let’s just take the good from it: I didn’t quit the set despite wanting to. The average split time may once have pleased my but I am usually like clockwork in my 400 and 800s – never varying by more than 1 second between sets. Today I was all over the place… Life goes on. My next challenge is: how do I manage to get out on the bike before Saturday’s race? I’m not going to taper for this race at all – Just a training event. That should have me at 8-9 hours for the week. 10x800m on 4:00 was the order of the day. It seems that I have regressed to weekly updates; not a disaster as far as readership is concerned but that was not the purpose of this site. The purpose was to write down feelings and thoughts after training with the hope that externalising my actions would prevent me from being injured. So far it has worked but now I am finding less and less time to write because I am busy at work, the girls are getting bigger and I’m training harder – and a little more too. So more stress and less relief! This week was a good one. The key sessions were my ‘long’ bike during which I averaged 35km/h for the four churches loop. It’s not as good as it sounds as I had the help of another rider – I reckon that adds 2-3 km/h to the average. It was still a good session. I had two good runs this week. 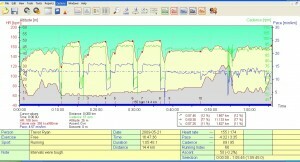 Firstly a 3x 2,1km interval set on 2 mins rest. This was made harder by the fact that I did 56 minutes on the trainer doing a big-gear set. I was tired starting and totally done by the time I got home. My second good run set was just last night: 8x800m on 4:00 the splits were 2:52, 2:52, 2:50, 2:50, 2:49, 2:58, 2:50, 2:44. Very slow and not-so-easy jog home. Today I swam 42 minutes and attempted a 5×5:2 trainer set. Didn’t go so well. 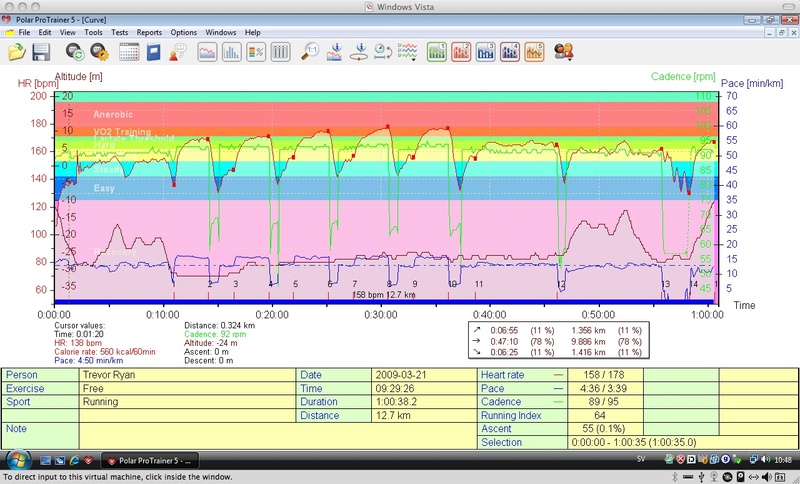 Low HR and high RPE… I could be getting tired. Haven’t updated in a while so I’ll be less specific than I usually am. Training has been nit and miss but my form seems to be building into something useable. I’m beginning to feel the seeds of strength on the bike and my running is close to race ready. In the transition from winter to summer training I have however dropped some swim fitness – Nothing too alarming and nothing that can’t be rectified in a week or two. 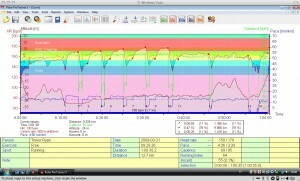 My key sessions in the last week have been a 3x2km interval set at 3:48/km on 1 min rest. The usual 4 churches bike loop @ 30,8km/h on a windy day and 15×400 on 2:00 all in 1:24 or less. These key sets have been padded by some indoor biking and a coupe of fairly fast trail runs. I’m standing at a gateway to fitness – there are three things to do now. Maybe it’s also time to call out one of my improvement suggestions from last year: allow yourself to fail. That means that I should just race. I didn’t get out on the bike on Monday but the chance arose on Tuesday. I reluctantly headed out from work at 4 o’clock and headed for my usual three churches lap. The wind was up, the average speed was down and I didn’t feel all that well. I battled with the wind and my mind for the guts of three hours to arrive home exhausted, tired and somewhat demoralised. 82km @ 28,6km/h. Wednesday was a little better if not a little rushed. Family time ate into my training time so I ended up driving to the track – something that I don’t want to make a habit of. Once there I did 15×400 on 2:00. Most were in 1:21 with one at 1:19, some at 1:20 and one in 1:22. Happy with the pace considering my legs felt heavy from Monday’s ride. Last but not least -well, actually it is the least- I did a 36 minute lunchtime swim: 10 minutes steady crawl, 8×33 kick/66 crawl, 10 minutes as 33m Hard / 8 seconds rest. Now – the question remains; will I get on the bike trainer tonight? I’m travelling tomorrow and have a million things to do today so my training for the week is most likely complete. Thursday: MTB – 43 minutes. I felt very tired during this. Maybe a little dehydrated. While post title said I’m finished for the week I’ll see if I can squeeze in something else. I have a 5km race on Wednesday. 1/ there was a football match on. 2/ the running track must be cleared. This was very difficult. 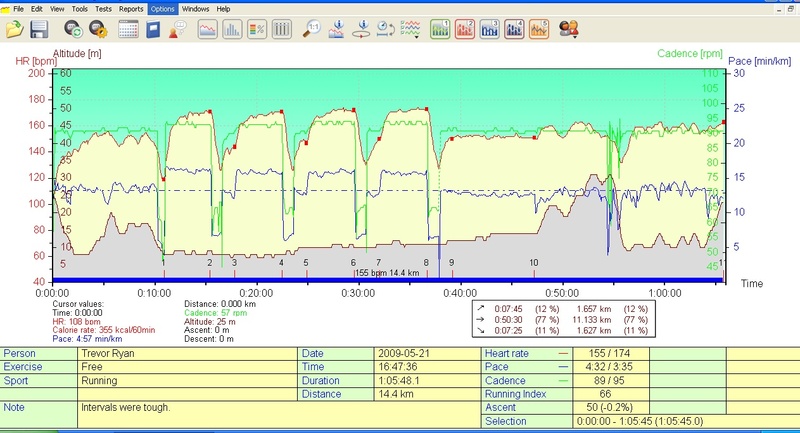 So difficult that I feel I will be lucky if I only get DOMS – this session was an injury risk. All 1200s were under 4:40 and I even considered doing another. Common sense, rather than tiredness was the factor in persuading myself to stop. The 1600 was at 4:44/km average pace (8:03/mile). The idea is that this last part of the workout might be a predictor og my Ironman pace – Purely theoretical, but unless I track it, I’ll never know. …which shows me how far off track I am. I love the track – it’s a great leveler. There’s no hiding from the results that a session on the track can supply; There is little or no effect from the wind, there’s no hills, the surface is uniform – in other words, there’s no excuses. So today’s workout, which was planned as a tester, to see how far I am from where I should be, showed great big holes in my fitness. When I planned it, I thought I might be able to do 8×800; I wasn’t sure to be honest. I got there and started running and felt pretty good, and for a while I thought I’d finish the set… The third 800 was when it all began to go wrong and at the fifth I called it a day – kind of. I then decided to run 1600 at my marathon HR. This turned out to be 7:30, or 4:29/km. Not too good, but that’s where I am at the moment – there’s no hiding from it! The first part of the test is based on pace, the second is based on HR – or how tired you are. I’ll see what kind of results it shows… Hopefully I can convince two or three other people to take the test and correlate our marathon times with the results.